I haven't read this myself yet, but have dipped into it, and would agree with NJ in her reference to 'neatness of phrase'. Hartnett, who earlier this year won Sweden's Astrid Lindgren memorial award, has the keen eye and freshness of vision to make the most ordinary event spring off the page. The flames of a gas fire "jump up like can-can dancers". Peake, the dog, has "treacle-coloured eyes, and a spiky moustache of wet whiskers after rummaging in the grass". The rhythms of her prose ask to be read aloud, always a test of good writing. "How does one craft sturdy happiness out of something as important, as complicated, as unrepeatable and as easily damaged as a life?" Maddy wonders as a child. "Is love the answer, or freedom from love?" Can a busy life compensate for searing loss? It's a story that seems bigger than its generously spaced 192 pages, and the stylised illustrations by Jon McNaught - waders silhouetted on a shore, dolphins thronging in a yacht's wake, a cloud of butterflies - add to the sense of travelling through a world both familiar and strange. Fairytales need to be handled with care to avoid descent into the twee - the worst being the ghastly Rainbow Fairy series, which no self-respecting child should touch with a bargepole. Spellbound is the opposite of this. Funny, clever, wise and charming, it's the kind of story that both girls and boys of 7+ will enjoy, and a pleasure to read aloud to younger ones of 5+. Being away with the fairies is not just a delight this summer, but something that will transform children for the better. Andy Warhol made works using his own urine; Piero Manzoni famously canned his faeces for the sake of art; Chris Ofili has used elephant dung in his paintings. And now Emily Gravett, who [has] won the UK's most prestigious children's illustration award, has revealed that her winning book was produced with the aid of rats' urine. At noon today Michael Portillo presented the 2008 CILIP Carnegie Medal to Philip Reeve for 'Here Lies Arthur' and the 2008 CILIP Kate Greenaway Medal to Emily Gravett for 'Little Mouse's Big Book of Fears'. "I didn't believe it at first," says Reeve, "but as I got over the shock and it began to sink in, I felt totally honoured. 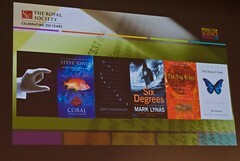 It is very special to win the CILIP Carnegie Medal. It has such a history and I admire so many past winners' work it is quite humbling to be ranked alongside them." Reeve already has three major book prizes to his credit. In 2001 his first novel 'Mortal Engines' was an instant success winning both the Nestle Smarties Gold Award (2002) and the Blue Peter Book of the Year (2003). 'A Darkling Plain' won the Guardian Children's Fiction Prize in 2006. "'Here Lies Arthur' is an outstanding book, and deserving winner," says Tricia Adams, Chair of the 12 strong librarian judging panel. "Reeve's is a consistent story-telling voice that brings us a subtle and credible retelling of the King Arthur myth. It is both a page turning adventure story and a clever historical novel. It also has clear political resonance for our times, demonstrating humanity's need to sustain hope and optimism, and our tendency to favour myth over reality to achieve that end." For the second time in three years, illustrator Emily Gravett has won the CILIP Kate Greenaway Medal. Gravett, whose debut picture book, 'Wolves' won the 2005 CILIP Kate Greenaway Medal wins the 2008 award for her fourth book, 'Little Mouse's Big Book of Fears'. Of this year's winning book, Tricia Adams, Chair of the CILIP Kate Greenaway judging panel comments: "Every time you read 'Little Mouse's Big Book of Fears' you discover something new: there's so much going on, so much to explore. The attention to detail is astounding. It's such a satisfying experience which incorporates smell, texture, humour and great imagination. The die-cut holes, and pull-out map are wonderfully novel features, but it's much more than just a novelty book: everything has a purpose and nothing is wasted. A book that not only works with lots of different age-groups, but also one that can be read, and re-read, and re-read again"
The Carnegie and Kate Greenaway Children's Book Awards are the UK's oldest and most prestigious awards for writing and illustration for young people. The Carnegie Medal celebrated its 70th Anniversary in 2007. Over the last seven decades it has come to be regarded as the arbiter of quality in writing for children and young people. Since 1937, the children's librarians who annually select the short list and winning title have recognised world class writers and frequently spotted fresh talent ahead of the market. Philip Reeve joins the list of past Medal winners that includes many of the greats of 20th and 21st century children's literature: Eleanor Farjeon, Anne Fine, Elizabeth Goudge, CS Lewis, Mary Norton, Noel Streatfeild, Philip Pullman and David Almond to name a few. Although there is no cash reward, the Carnegie is regarded by many as the most prestigious acknowledgement of writing due to its unique judging process. Most of today's literary and book awards seek submissions from publishers and votes from the public. Not the CILIP Carnegie: the Medal's selection process is rooted in the professional expertise of librarians across the country who nominate titles for the long list. A panel of 12 children's librarian judges from the Youth Libraries Group then select the shortlist of up to eight titles and finally the winner. Francesca Dow showing guests the view from the 7th floor of Tate Modern, where Puffin held its summer party last night. More photos from the event to follow. Sophie Masson writes about creating book trailers on her blog. 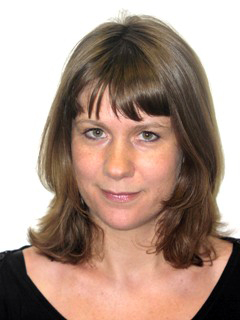 Tania Vian-Smith has returned to Puffin, where she began her career in children's publishing as a Press Officer in 2003. She left Puffin in 2006 and moved to Egmont as a Senior Press Officer and the following year became their acting Publicity Manager. At the start of this week she moved back to Puffin to take up a permanent role as Publicity Manager. Prior to working in publishing, she was Head of English at Brentford School for Girls and then spent 2 years TEFL teaching in Barcelona. On Monday (16th June) Gervelie returned to her primary school, St Thomas More School in Norwich, to talk to a group of year 6 pupils about what is like leaving home in hurry, and the difference between a refugee and an illegal immigrant. The day was filmed by BBC's Newsround and BBC Radio 4's Go4 It made a special programme which will be broadcast on 22nd June. Gervelie and authors Annemarie Young and Anthony Robinson talked about events in Gervelie's life and the book Gervelie's Journey, the first in a new series that tell the true stories of refugees. The books are published by Frances Lincoln. The Royal Society Science Book Award winners were announced last night at an event compered by Newsround presenter Sonali Gudka, with the presentations made by Lord Rees. 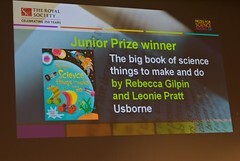 The Junior Prize was won by The Usborne Big Book of Science Things To Make & Do by Rebecca Gilpin and Leonie Pratt. The General (Adult) Prize was won by Six Degrees: Our Future On A Hotter Planet by Mark Lynas. It's the penultimate two snetences of this quotoation from the review, surely, that cut home most tellingly. _-25, originally uploaded by achuka. A PA response to the unprecedented protest by children's authors against proposals to age-band books was printed in The Guardian yesterday. Yes, there will always be children "whose reading age will be a couple of years ahead or behind the number of birthdays they've celebrated". However, age guidance isn't actually about reading age - it is about content and the appropriate interest level for children..
argues Simon Juden. Well, isn't that rather difficult to judge? And, particularly in terms of teen and young adult fiction, isn't this going to veer very close to censorship? If it's not about reading age, and all about "content and appropriate interest level" who on earth is going to decide what the difference between 7+, 9+ and 11+ is going to be in this regard? Philip Pullman made a very fine distinction in last Saturday's Guardian between a bookseller's advice or a reviewer's opinion that a book would be suitable for 9+, and having that imprinted on the very cover of the book, as if the publisher and author are jointly saying 8-year-olds pick up this book at your peril. 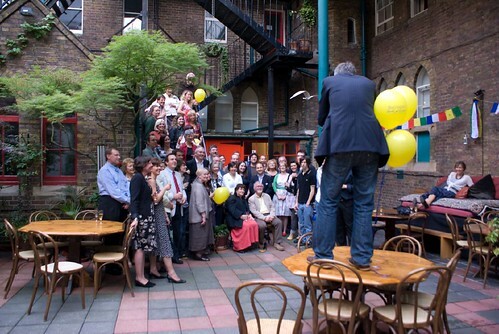 Authors and illustrators assembling in the courtyard of the Oktober gallery for a group photo, at Barrington Stoke's 10th birthday celebrations last night. Barrington Stoke's mission is to help children enjoy reading. For a decade Barrington Stoke has published accessible and unpatronising short books for children who are dyslexic, struggling to read, or simply reluctant to sit down with a book. The stories are by some of the best children's authors working today. Each book is read before publication by struggling readers of the right age, so that the final book is both accessible and a good read. There's nothing on the stylish covers (especially in recent years) to suggest that the books are for less fluent readers. So it isn't surprising that top authors and artists mingled with consultants (readers who had worked on their books) at the 10th birthday celebrations. Sonia Raphael, Managing Director spoke about the many touching letters they received form parents, teachers and children telling them how finding Barrington Stoke had made a difference to their lives. "From the mother who wrote in with such glee that she had just had to tell her son off for reading under the covers with a torch, she never thought she would ever see him reading a book let alone when he shouldn't have been .. . To the 15 year old who wrote 'this is the best book I have ever read - in fact it is the only book I have ever read by myself.'... We are so privileged to be able to make such a difference and whilst we know Barrington Stoke is special, we have only been successful because of all the people who have believed in and supported what we were trying to do." Booktrust has announced that over two million free books will be given to every reception-aged pupil and Year 7 pupil in England by Christmas 2008. The Booktime programme for reception-aged pupils (4-5 years old) and Booked Up programme for Year 7 pupils (aged 11-12), are both run by the independent national charity Booktrust, with the aim of encouraging reading for pleasure. The programmes are supported by the DCSF (Department for Children, Schools and Families) with an allocation of over £4m, making both programmes free to all participating schools. The Booktime programme, which is run in association with education and publishing company Pearson, will this year give a copy of Harry and the Dinosaurs go to School by Ian Whybrow, illustrated by Adrian Reynolds. The packs will also contain a guidance booklet for parents and carers to encourage sharing books with children. For the first time, free poetry anthologies will be given to both age groups in England. Reception-aged pupils will get a special abridged edition of The Puffin Book of Fantastic First Poems, while Year 7 pupils will be able to choose a copy of Read Me and Laugh: A Funny Poem for Every Day of the Year (Macmillan). The Booked Up programme allows each child to make their own choice of book from a selection of 12 titles. The programme encourages Year 7 pupils to read independently and aims to maintain the development of reading levels between Years 6 and 7 as children make the difficult transition from primary to secondary education. Superb feature about Allan Ahlberg by Nicolette Jones, writing in The Telegraph a few days ago. is currently Jenny Valentine, author of the Guardian Award-winning Finding Violet Park and Broken Soup. Allan Ahlberg opening one of his presents (an Eric Ravilious print) and blowing out the last candle on his cake at his 70th birthday party co-hosted by Puffin and Walker Books, and held on Puffin's 10th floor. More pictures from the event viewable , at my Flickr account, or view a slideshow. ...there are no boring bits. Tension is piled upon tension and, ironically, it's the don't-forget-the-knife-that-kills-me that gets in the way. The main meat of the story is so well told that we don't need the death-foretold hanging over us. And, when it comes, there is the twist. McGowan is a wonderful writer, and this is a gripping and tragically topical story of one boy's spiral into knife-crime but, although it was the title that first drew me in, I rather wish he hadn't ended up being constrained by it. "The best novel about fathers ever is To Kill a Mockingbird," Cottrell Boyce says. "You think your father is some bumbling old man, and you discover he's Atticus, he's the hero-dad. Liam knows his dad will bail him out. You never feel like you're doing a great job, you think you've got to be flawless, but the most you can do is to be generous and loving and just there." "New features include Justin's blog, competitions, Crew Confidential & much more - sign up to become a Vampirates VIP for exclusive content..."
Exclusive content includes access to the Blog. The Bookseller online today carried a report about the mounting wave of protest and cries of alarm over the issue of agebanding. The list of those protesting against the proposed age banding of children's books is headed by the names of four Children's Laureates, including the present one. The host of highly esteemed authors and illustrators on the rest of the list must at least make those responsible for proposing the idea question the way they have gone about its introduction. The list is growing daily. The voices of authors supporting agebanding are few and far between. "This is the second golden age for young-adult books," says David Levithan, an acclaimed author of several young-adult novels ("Wide Awake," "Nick & Norah's Infinite Playlist") and executive editorial director at Scholastic Inc., the world's largest publisher and distributor of books for kids and teens. In just the past few years, Scholastic and many other publishers of young-adult (also known as YA) fiction have seen "amazing success," says Levithan, who calls this the "most exciting time for young-adult literature since the late 1960s and 1970s when 'The Chocolate War' [by Robert Cormier] and 'Forever' [by Judy Blume] were published." "I have refused point-blank to allow age branding be put on my books, and will fight tooth and nail to keep it off. I advise all other children's writers to do the same.."
Read Darren Shan's full response to the post below by clicking the Comment link, then add your own views here on this Blog. Aleks Krotoski: Why is the book world threatened by gamers? Are Books Too Static For Gaming Generation? [Books] are snapshots of information at a single point in time, where stories are created and navigated from the point of view of one person. Social media has changed the nature of information gathering and production, and multiplayer games have re-inspired collaborative play. Static media which insists on remaining static is on its way to becoming a curiosity. I cite this piece mainly for the quality of thought and writing it contains, rather than for any explicit relevance for children's literature, although there is some ground, I suppose, for arguing that Philip Pullman in His Dark Materials has come as close as anyone to being an "inspired synthesiser".